Sister Mary Henry O’Connell, S.H.C.J., who was a Sister of the Holy Child Jesus for 79 years, died of heart failure at Holy Child Center in Rosemont Nov. 16. She was 102. Born in Morton, Delaware County, Sister Mary Henry graduated from the former St. Leonard’s Academy in Philadelphia in 1930 then entered the Convent of the Sisters of the Holy Child Jesus. She professed her first vows in 1933 and her final vows in 1938. She was well known to many by her former religious name, Mother Mary Henry. Sister Mary Henry served in the Philadelphia area for more than 30 years. She began her ministry teaching at Holy Child Academy in Drexel Hill from 1933-1946. A natural administrator, she quickly excelled and became the school’s principal from 1943-1946, while continuing to teach. Next, she taught at Holy Child Academy in Sharon Hill from 1946-1955. In 1977, she returned to Holy Child Academy in Drexel Hill and taught for two more years. From 1990-1993, she headed the computer lab at St. Edward School in Philadelphia. From 1993-2007, Sister Mary Henry performed community service while living in Sharon Hill. This involved everything from keeping in touch with and continuing to serve as a mentor to many former students, attending alumnae events, and collecting the tabs from soda cans to donate to the Ronald McDonald House. She continued to do community service after moving to New Sharon in Rosemont in 2007. Outside the Philadelphia area, Sister Mary Henry also taught and served as principal at St. Ignatius School in Chicago from 1955-1964 and St. Mary’s Grade School in Melrose, Mass., from 1964-1968. She also taught at St. Elizabeth’s School in New York City from 1968-1971 and at SS. Peter and Paul in Mount Vernon, N.Y., from 1971-1977. At Our Lady of Lourdes in New York City, she taught and served as librarian from 1979-1989. Sister Mary Henry held a bachelor’s degree in history and a master’s degree in education. Both degrees were earned at Villanova University, the first in 1944 and the second in 1946. She is survived her religious community, several cousins, nieces, nephews, as well as several grand and great grand nieces and nephews. A funeral Mass will be celebrated Tuesday, Nov. 20 at 11 a.m. in the New Sharon Chapel, 1341 Montgomery Avenue, Rosemont. A viewing will be held at 10 a.m. Burial will follow at Calvary Cemetery in West Conshohocken. There was a wake service in the New Sharon Chapel Monday, Nov. 19. In lieu of flowers, memorial donations may be sent to the SHCJ Retirement Fund, 1341 Montgomery Avenue, Rosemont, PA 19010. 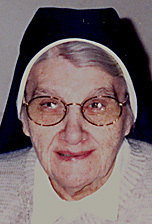 PREVIOUS: Sister Marita Anne McGonigle, I.H.M.